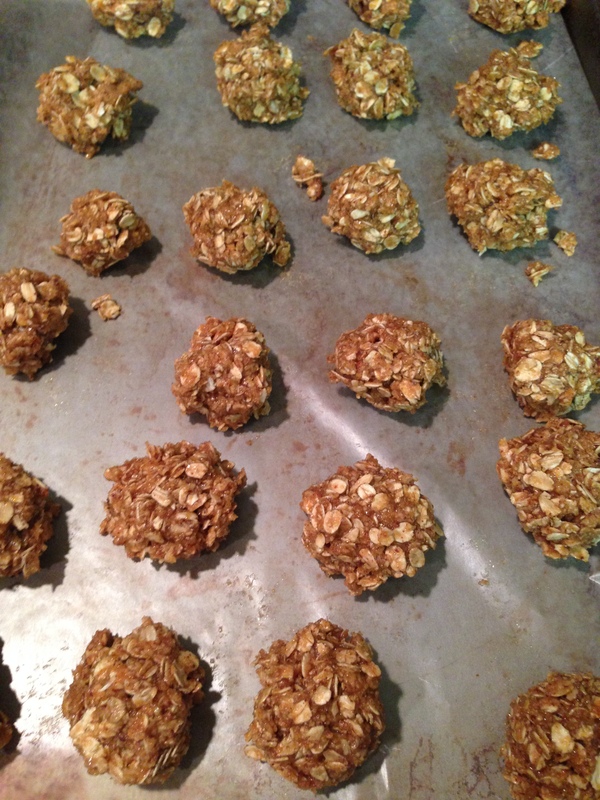 Quick Fix: Energy Bites – Fix. Serve. Our household snack selection is anemic and hardly ever offers interesting items to choose from. I am not destined to be the cool Mom that showcases a cupboard full of excitement to our children and their friends. I got nothin’. Which is probably why I have heard from neighbors that our boys have begun making friendly stops at houses while walking the dog to “say hello” and conveniently score snacks. Our kids aren’t snack bar kind of kids. So granola bars and cereal bars just sit in their boxes and go stale. I try to avoid buying processed snacks which basically leaves me with fruit, vegetables, nuts and cheese. BORING. I realize that there are infinite ideas for healthy snacks, but ain’t no one got time for fruit skewers with homemade yogurt dip or smiley face veggie platters. I need quick, mass quantity, under five ingredient snacks. Enter Energy Bites. My mother received this recipe from her fitness instructor, and ever since I came into possession of it, these have been in constant supply in our house. Finally! 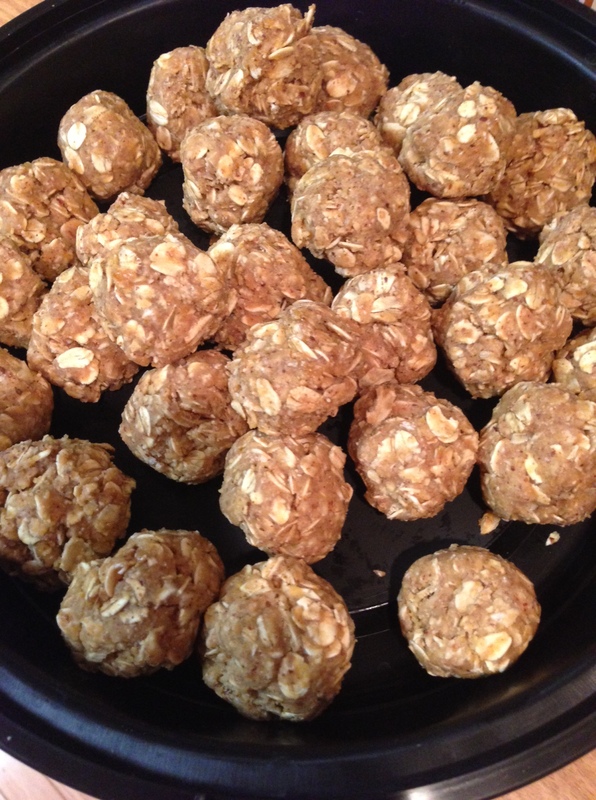 A new snack to keep on hand that is nutritious AND so easy to prepare. These will also be added to my list of great ideas of food to give to people. 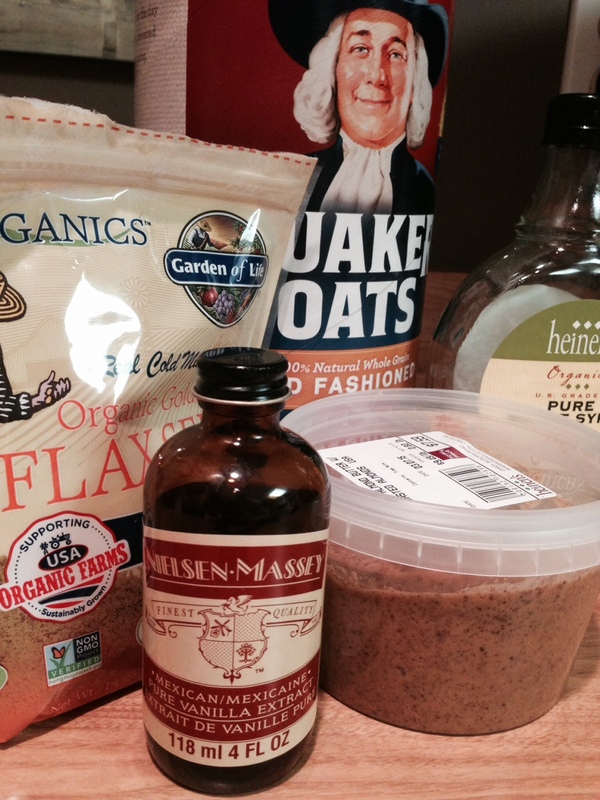 All you need are these five ingredients: Oatmeal, ground flax seed, almond butter, maple syrup and vanilla. Mix ingredients together in a large bowl. Form into one-inch balls and store in freezer. Done! Tip: The mixture is very sticky. If you are impatient like me, you can form the balls right away. If you have time, drop about 1 tablespoon of the mixture onto a baking sheet lined with wax paper, like you would cookie dough. Place in freezer for about 10 minutes, then remove and form the balls, placing them in a freezer bag or container for storage.